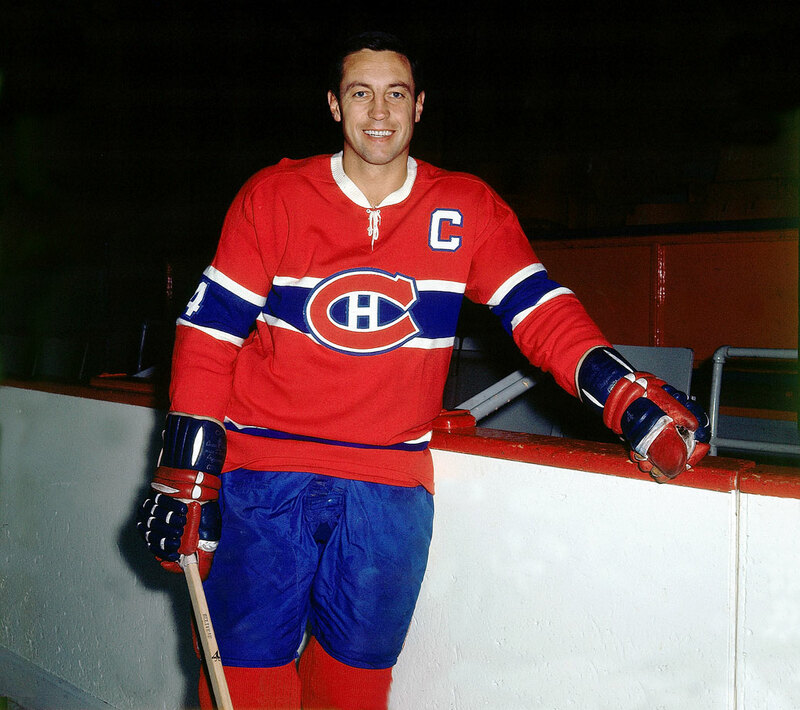 • In 1955-56, Béliveau enjoyed his best season with the Canadiens. 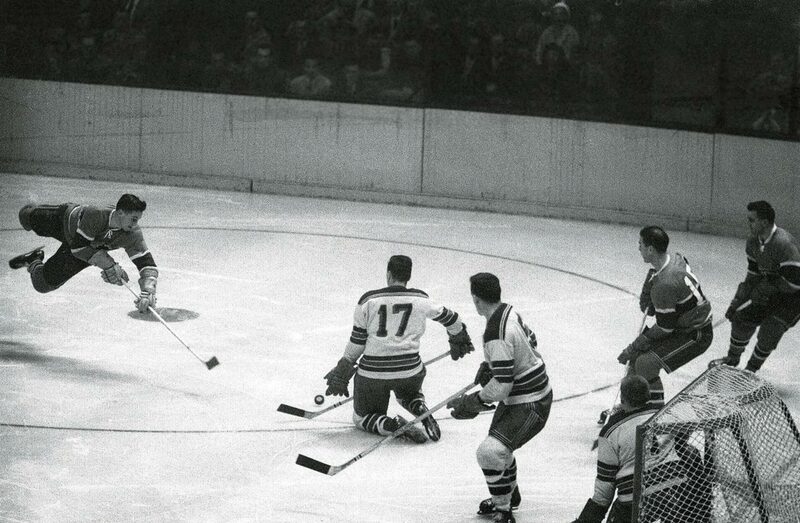 ''Le Gros Bill'' led the NHL in goals (47) and points (88) on the way to winning the Hart Trophy as league MVP. • On April 10, 1956, Béliveau won his first of 10 Stanley Cups when the Canadiens beat the Detroit Red Wings. 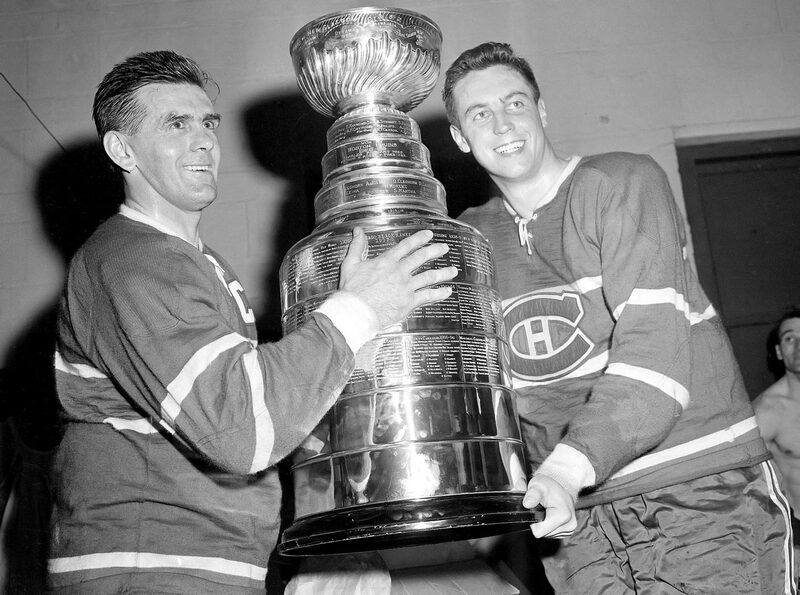 Béliveau said he had two dreams growing up: playing for the Habs and winning the Cup, and this gave him that satisfaction. 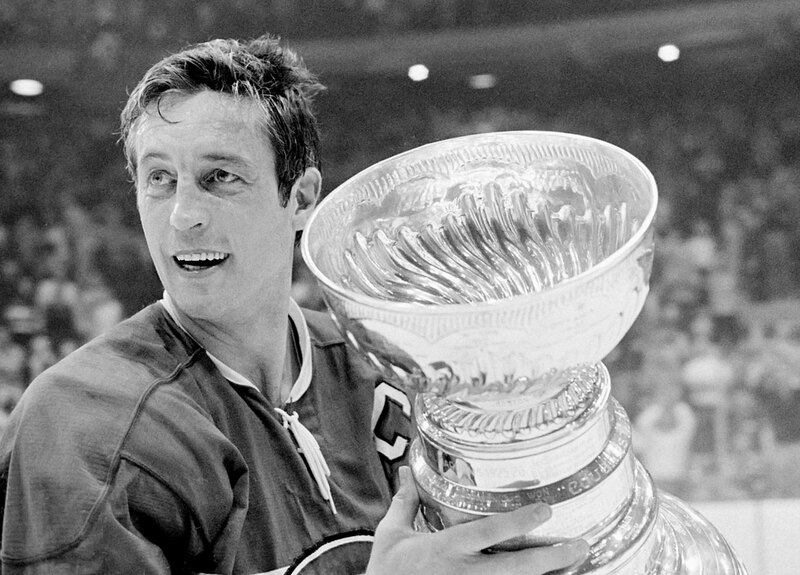 • In 1965, Béliveau became the only captain to score the Stanley Cup-winning goal and win the Conn Smythe Trophy as playoff MVP. 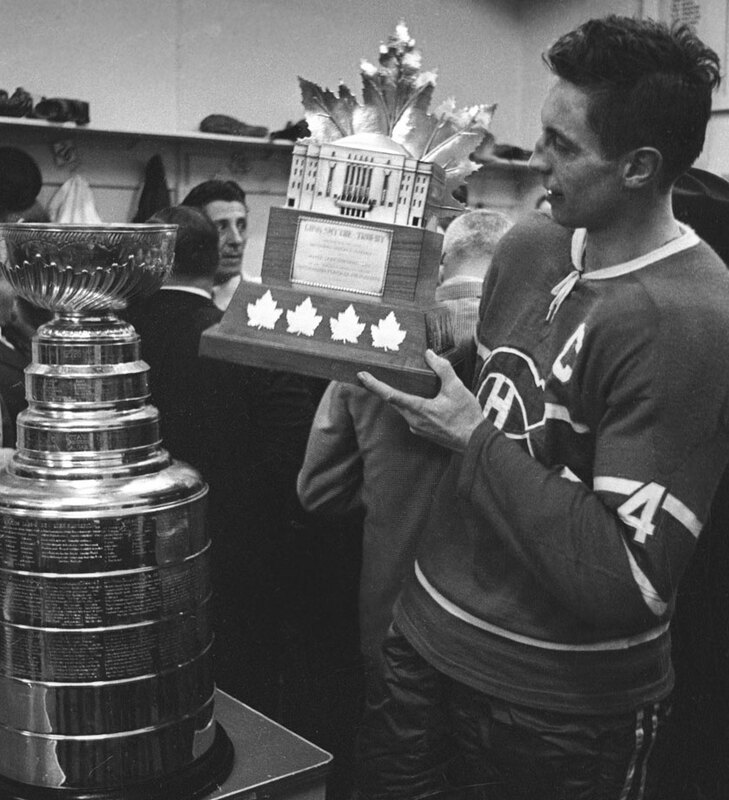 In the first year the Conn Smythe was given out, Béliveau also got to lift the Cup as captain for the first time. 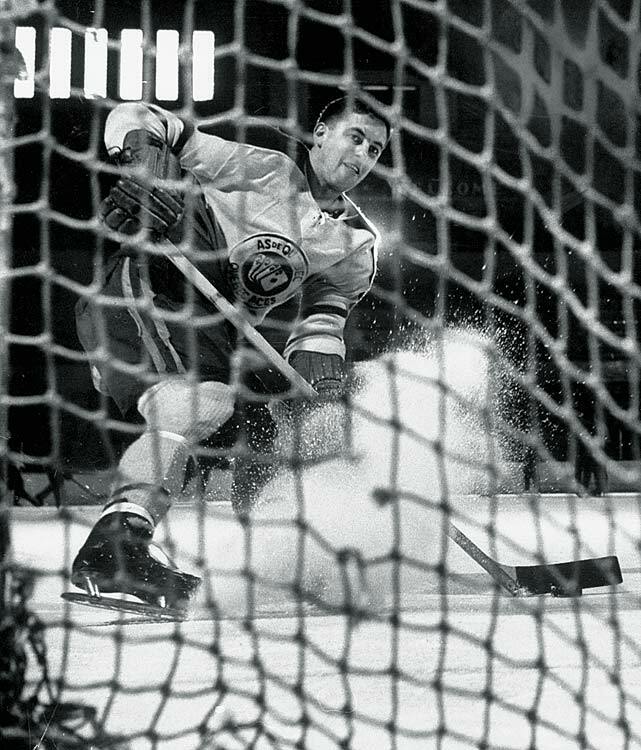 • When Béliveau retired following the 1970-71 season, he was the Canadiens' career leader in points (1,219) and the NHL's all-time leading playoff scorer with 176 points in 162 games. He was inducted into the Hall of Fame in 1972. 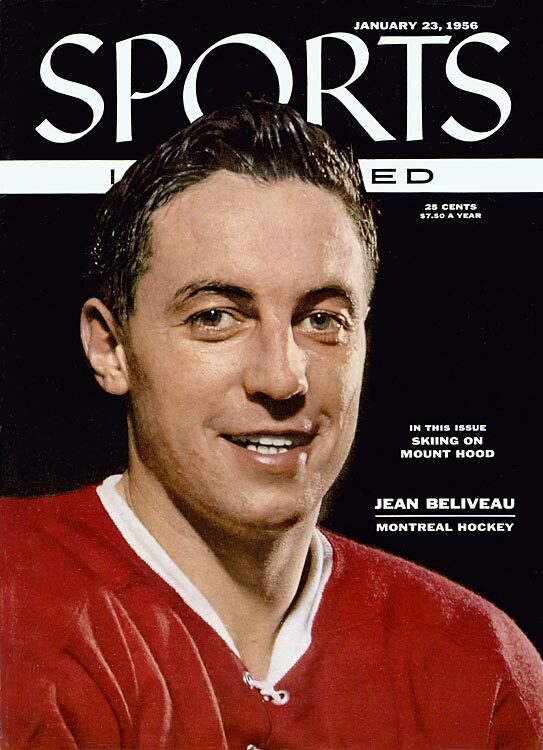 Jean Béliveau was the first hockey player to appear on the cover of Sports Illustrated. This Jan. 23, 1956 cover was hardly a jinx, as Beliveau went on to win the Hart Memorial Trophy (MVP) and Art Ross Trophy (Top Point Scorer) following the season. Jean Béliveau, playing with the Quebec Aces of the Quebec Senior Hockey League (QSHL), looks to shoot the puck into the net in Dec. 1952. 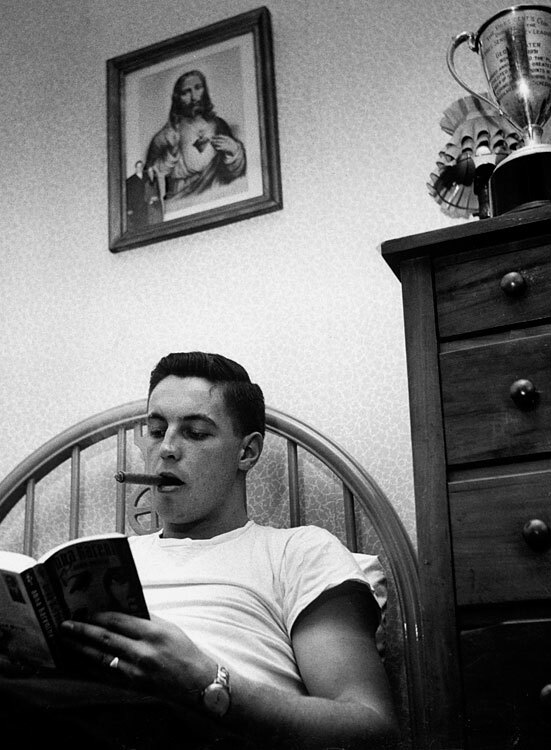 Jean Béliveau lies in bed reading Tolstoy's Anna Karenina with a cigar in his mouth in Dec. 1952. 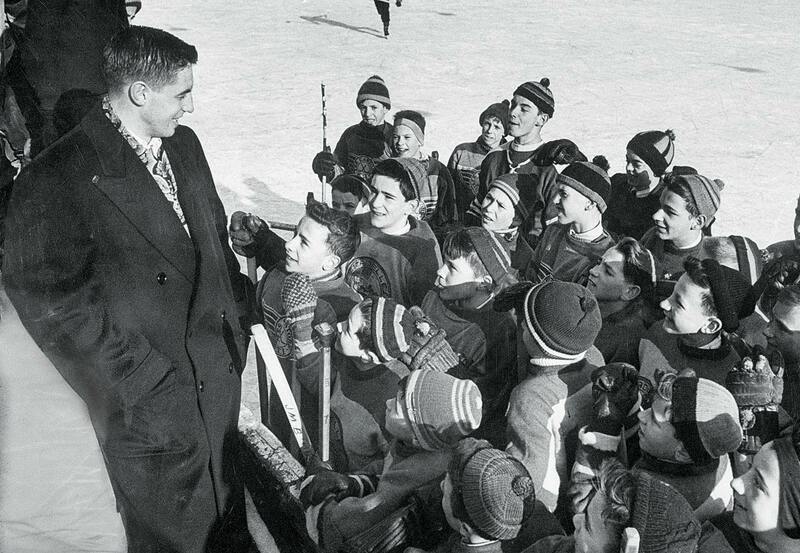 Jean Béliveau greets young fans at an outdoor skating rink in Dec. 1952. 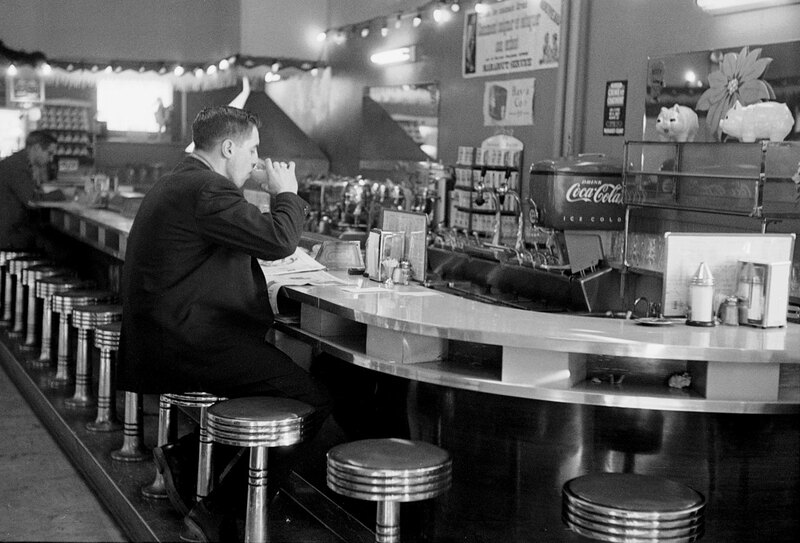 Jean Béliveau reads a newspaper at the counter of a diner in Montreal in Dec. 1952. 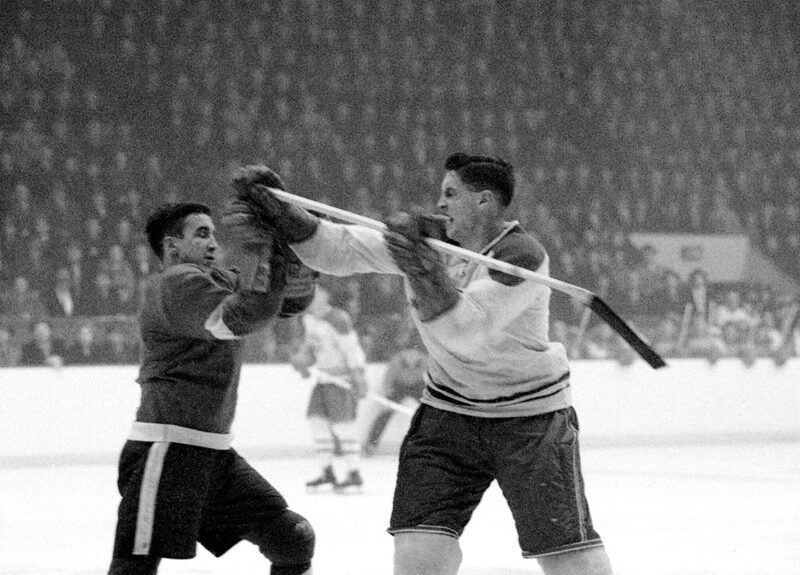 Jean Béliveau aka "Le Gros Bill" mixes it up with Red Wings left wing Terrible Ted Lindsay during a game in Montreal on Feb. 17, 1955. Jean Béliveau flies through the air while shooting the puck against the New York Rangers at Madison Square Garden on Nov. 20, 1955. 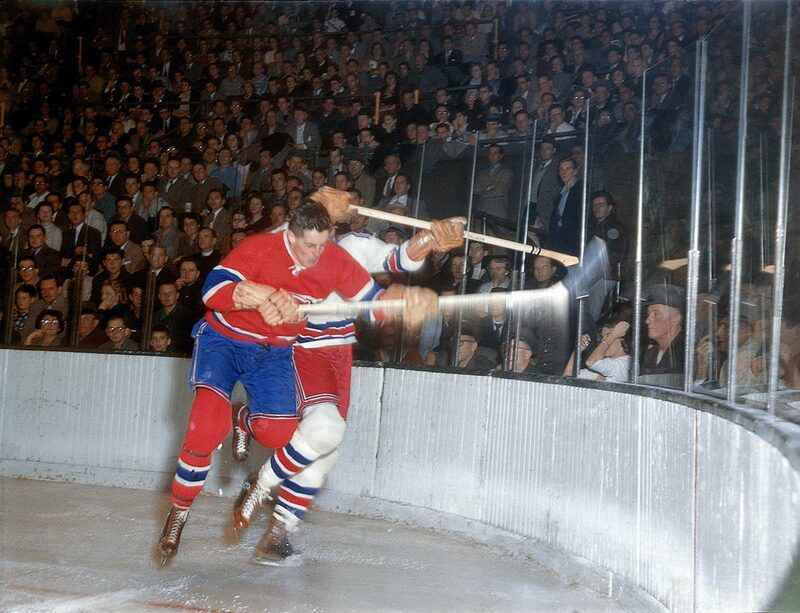 Jean Béliveau checks Rangers defenseman Lou Fontinato into the boards during a game in New York on Nov. 27, 1955. 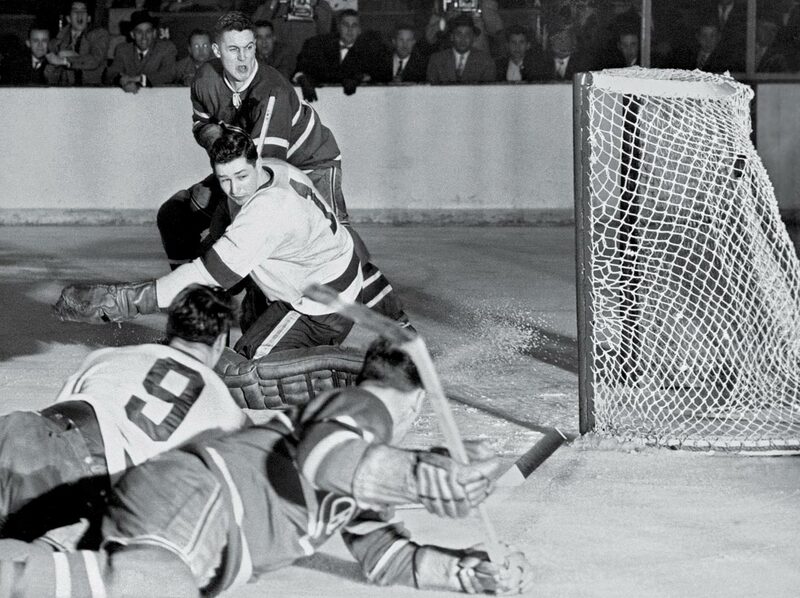 Jean Béliveau shoots the puck past Red Wings goalie Glenn Hall as Gordie Howe (9) and Henri Richard sprawl on the ice in the second period of Game 5 of the Stanley Cup Final on April 10, 1956. Montreal won the game 3-1, taking the Cup. 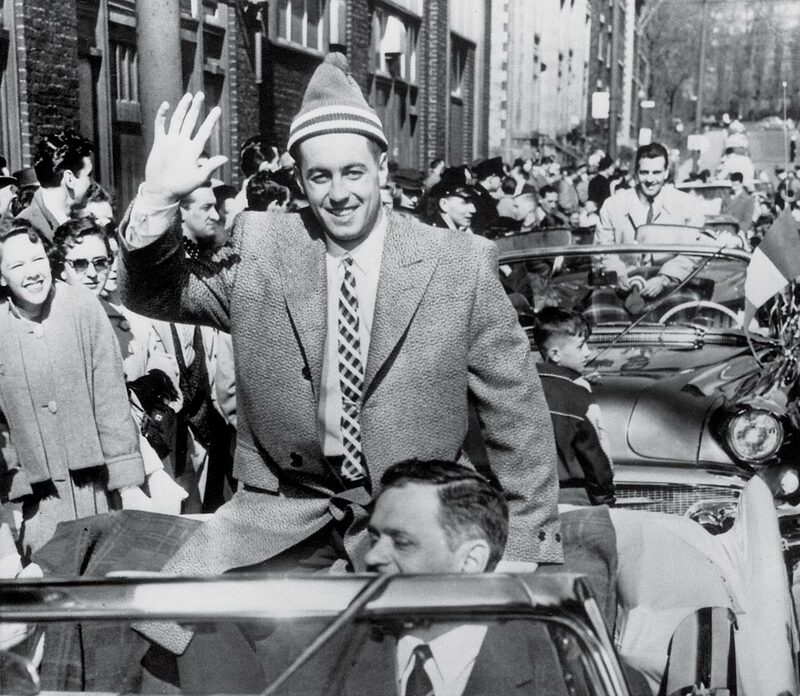 The Canadiens' captain and conquering hero waves to the crowd at the Stanley Cup victory parade in Montreal in mid-April 1956. 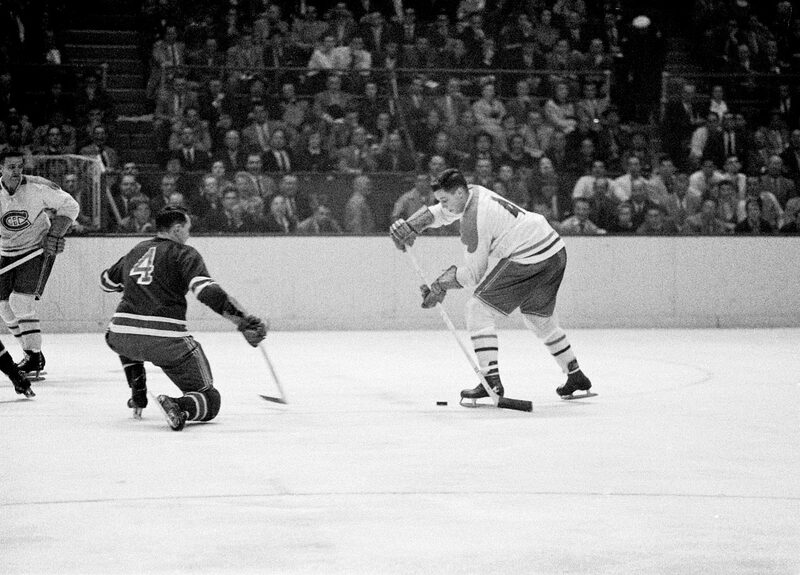 Jean Béliveau looks to shoot the puck past Rangers defenseman Bill Gadsby during a game in New York on Oct. 24, 1956. 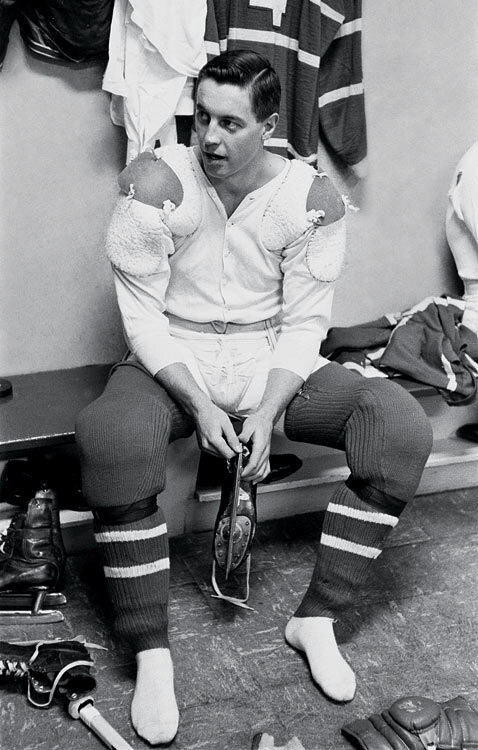 Jean Béliveau in the Canadiens' locker room before a game against the Chicago Blackhawks in Montreal on Jan. 25, 1958. Jean Béliveau and Maurice Richard (left) smile in the dressing room with the Stanley Cup after defeating the Boston Bruins 5-3 in Game 6 of the Stanley Cup Finals at the Boston Garden on April 20, 1958. Jean Béliveau holds the Conn Smythe Trophy in the locker room after the Canadiens defeated the Blackhawks in Game 7 of the Stanley Cup Final on May 1, 1965. He became the first player to receive the trophy, which is awarded to the postseason's Most Valuable Player. 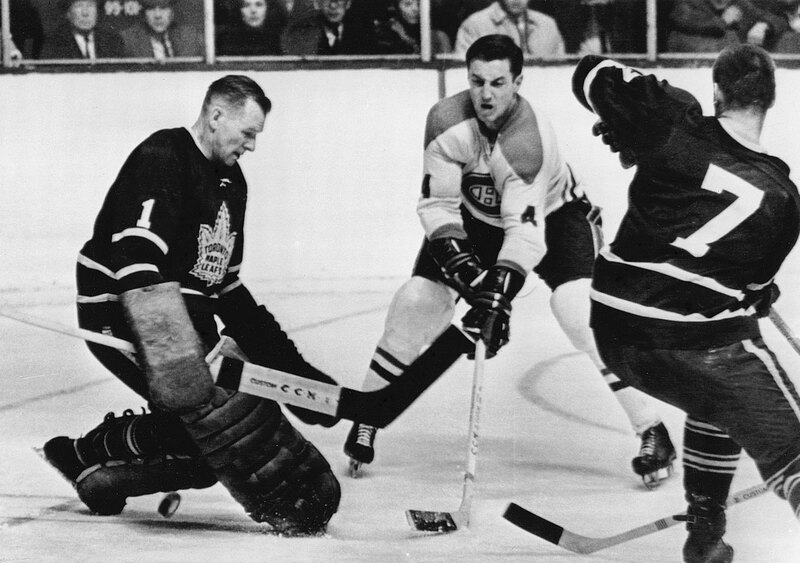 Jean Béliveau flicks the puck between the legs of Maple Leafs goalie Johnny Bower as defenseman Tim Horton looks on during a game on Feb. 22, 1967 in Toronto. The Hockey Hall of Famer in 1970. 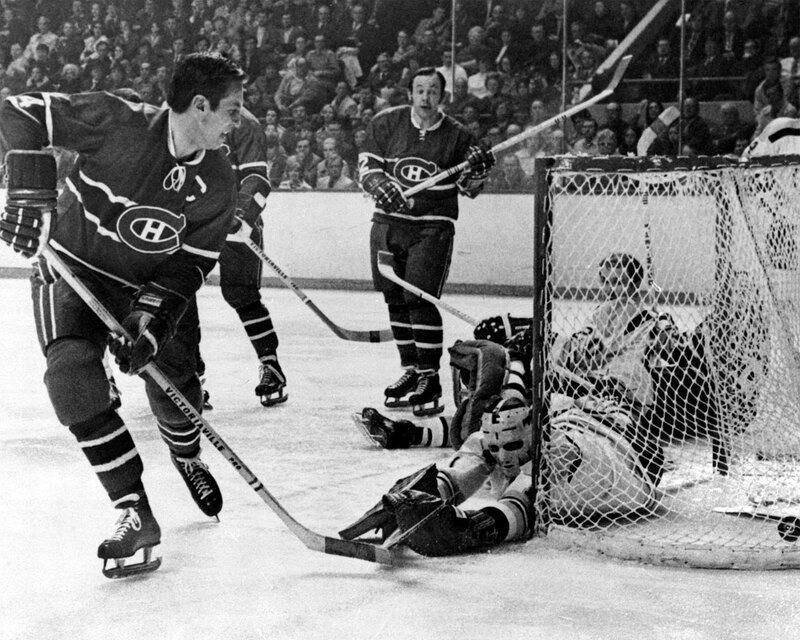 Jean Béliveau scores on Bruins goalie Eddie Johnston as Beliveau's teammate Yvan Cournoyer (12) looks on during Game 2 of the Stanley Cup Quarterfinals in Boston on April 8, 1971. Jean Béliveau holds the Stanley Cup after his final game, a 3-2 victory over the Chicago Blackhawks in Game 7 of the Stanley Cup Finals on May 18, 1971. 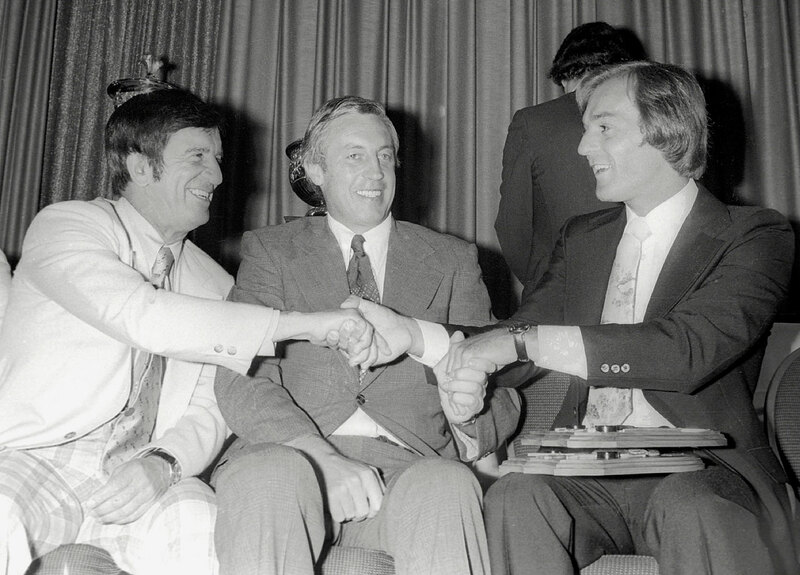 Jean Béliveau sits between Ted Lindsay (left) and Guy Lafleur as the two shake hands at an award ceremony in the late 1970s. 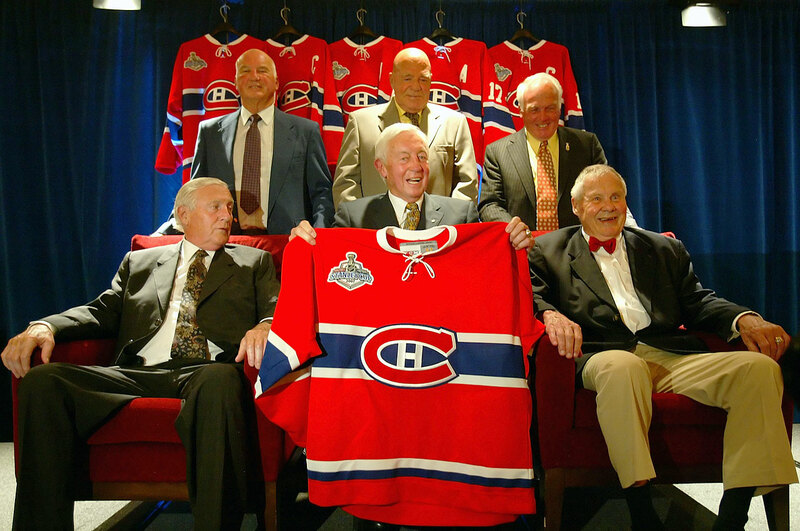 Jean Béliveau (front center) poses with former Canadiens (left to right) Dickie Moore, Don Marshall, Jean-Guy Talbot, Henri Richard and Tom Johnson during the "Salute to the Stanley Cup Legends" in Ottawa on June 1, 2007. 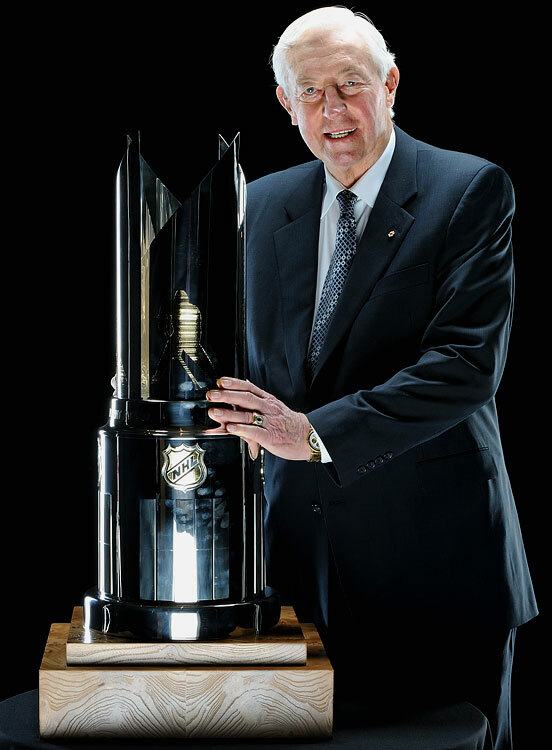 Jean Béliveau poses with his NHL Lifetime Achievement Award after the 2009 NHL Awards in Las Vegas on June 18, 2009.